You can easily add virtual tours to your Featured Listings in IDX Broker by clicking Listings in the main menu, and Active in the submenu. Virtual tours are listed in the "VT" column. To enter in a new virtual tour, click the number under the VT column for the listing you would like to edit. A pop-up box will appear where you can enter in information about the virtual tour. In the Virtual Tour URL field, be sure to enter in the entire link for your virtual tour, including the http://. 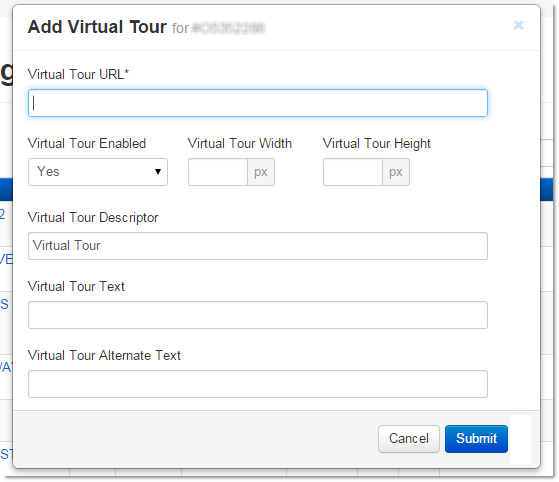 Make sure Virtual Tour Enabled is set to Yes, and enter in a width and height for the the pop-box that will display your virtual tour. Enter in the rest of the details, and then click Submit. You can view the virtual tour on a listing by viewing its search results or property details IDX page. Note: In many cases, a virtual tour may be automatically linked to a property by the MLS, requiring no action on your part.